TOI Water offers premium comfort with a combination of the following features: an extra large sink, soap dispenser, paper towel holder and sturdy foot pump. 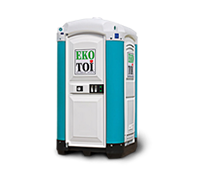 So you need a mobile toilet with extra comfort for the site or an event? Even for this, we have the suitable solution with modern design. An integrated in the wall dual-system allows for ample wash basins, soap dispensers and paper towels.